A huge rally was taken out in Agartala to pay rich tribute to Netaji Subhas Chandra Bose on his 122nd birth anniversary celebration along with other parts of India. The main programme was organized by the students of Netaji Subash Vidya Niketan School Agartala, the state capital of Tripura. The Ajad Hind flag was fluttered along with the national flag on this day to remember the hero of the nation. The colorful rally, brought out on the occasion, depicted Subhash Chandra Bose’s ideology and the freedom struggle, cosmopolitan society of India and the prevailing evils which are a curse to mankind. Hundreds of school students, various organisations and clubs participated in the rally that went through the streets of Agartala amid thousands of spectators’ crowding on both sides of the roads. Subhas Chandra Bose, popularly known as ‘Netaji’ (beloved leader), was born in a refined Bengali family of Cuttack in Orissa (now Odisha) and was the catalyst in sowing seeds of independent India and revolutionary ideas in the impressionist minds of the youngsters. The rally depicted India’s freedom movement with emphasis on Subash Bose’s role, India’s unity in the diverse, disasters, militancy, existing taboos in the society, and other socio-cultural subjects. The participants in the rally also portrayed the traditional tribal culture, culture of the tea garden workers, Odisha’s Sambalpuri folk dance and various mythological epics. 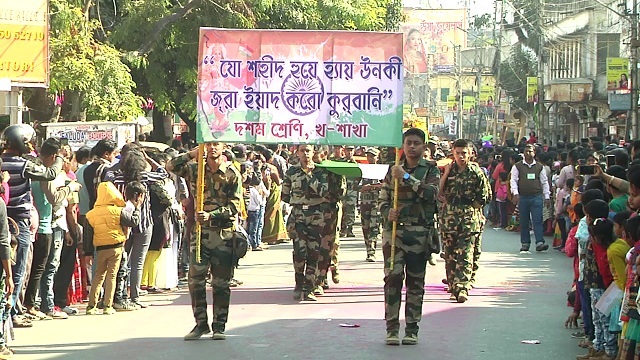 As the rally was taken out, hundreds and thousands of spectators including women and children gathered along the streets of Agartala, the capital city, to witness the procession.